Revival of True India: Meditation and the Thousand-headed Cobra! Meditation and the Thousand-headed Cobra! If you look at the mythological pictures, you will find Mahavir sitting with a five headed cobra behind him. 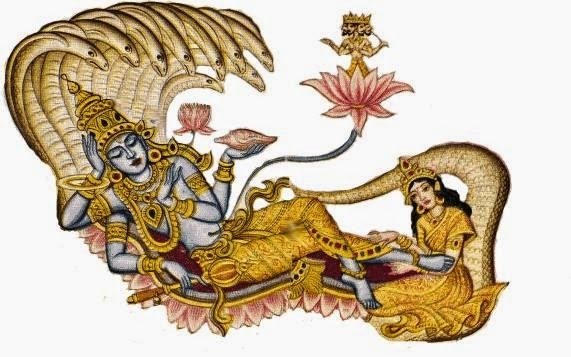 Or Lord Vishnu is sitting in meditation and there is a cobra behind him. Even in the pictures of Rishis, you will find a cobra with its hood open at the back. Have you seen such pictures? It is a very subtle thing! See, when you are sitting in meditation, what is happening? Your consciousness is getting alert, opened and awakened, as though in your back ground there is a thousand headed cobra. Cobra signifies alertness. How many of you feel a lot of alertness in the back of your head during meditation? A sort of wakefulness! So the cobra is a symbol of the energy that raises and opens up; energy which is alert and at the same time restful. It is not that there was really a cobra at the back of their head, it is a symbol of wakefulness in the deep state of rest, and that is meditation – totally restful, wanting nothing, doing nothing, being nothing and being open, like the hood of a cobra; alert without any effort. There are two types of descriptions for this. In one they talk about a Cobra, and in another they talk about a flower; it is like a thousand-petaled lotus, blossoming on the top of the head; on the crown chakra. So some describe it as a flower, very delicate, and some describe it as a cobra which means alert. Both fit very well.